Digital Marketing Certifications benefit you irrespective of the stage you are at in your digital marketing career. Whether you are starting out in the field of digital marketing or have been into digital marketing for quite some time now, these professional digital marketing certifications help you progress further ahead in your career and also gain a competitive advantage over your peers in terms of acquiring knowledge and applying it practically. The good thing is that you can access the course material for free for most of these digital marketing certifications. Some charge you for the exam fees and certifications while some are absolutely free. 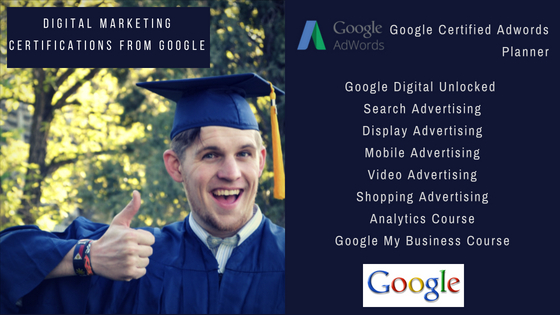 Google has a wide spectrum of digital marketing courses certifications that can help you gain a deeper understanding of digital marketing. The most popular certification from Google is the Google Adwords certification. When you enrol for the Google Adwords Certification you also get to learn beginner to intermediate level SEO skills along with mastering advertising skills. This certification is valid for a year. For obtaining the Google Adwords Certification, you will have to clear the Adwords Fundamentals exam first and then select and pass any one from the additional assessments- Search advertising, display advertising, mobile advertising, video advertising and shopping advertising. Cost per exam: USD 50. As you have to pass 2 tests for getting the Adwords certification, it is a total of USD 100. To get started with acquiring Google Certifications, you can go to Google Partners and sign up as a Google Partner. Once you log in, you can gain access to all the digital marketing certification courses that Google Offers. There are a lot of free certification courses too.Google has a credit system for their free courses where you have to finish learning certain topics and courses to further unlock advanced course material. 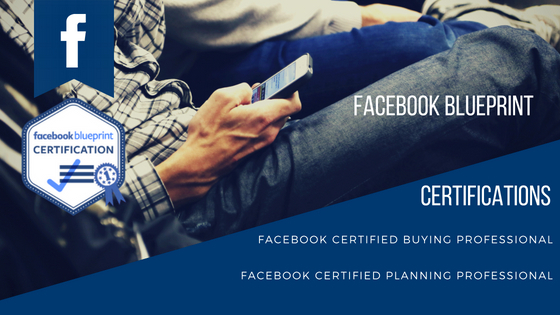 Facebook Blueprint is the learning platform for working towards getting your digital marketing certifications from Facebook. The course material is free for everyone to learn and benefit from. However, you have to pay a fee for writing the exam and getting your formal certification from Facebook. 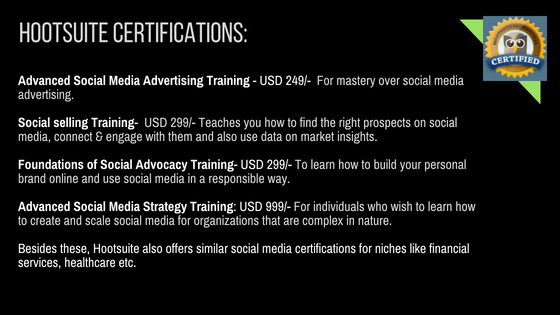 This is the advanced digital marketing certification that Facebook Blueprint offers. You have to demonstrate a high level of competency in managing, creating & purchasing ads, ads buying types, expertise in improving ad performance and delivery through the ad auction, troubleshooting any ad issues, reporting, mapping and Facebook pixel use. Facebook Blueprint Certification Cost: Facebook charges $150 as exam and certification fees. In India, the cost is approximately INR 10,000/- for the certification. The exam duration is 75 minutes in which you will have to answer about 50-60 questions and you need to get a minimum score of 700/1000 to clear the exam. Hubspot is a digital marketing company that offers many tools to automate digital marketing systems. They have 4 main products -for sales, marketing, customer service and CRM. 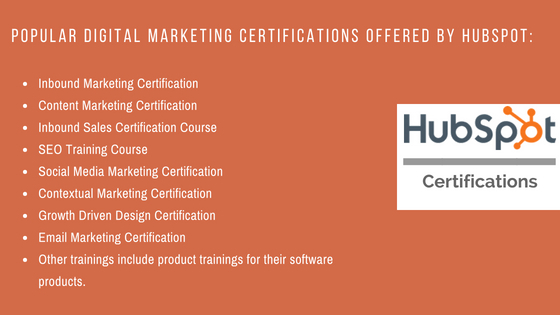 Hubspot also offers a variety of digital marketing certifications you can choose from. First, you will have to register yourself and verify your Hubspot Account. Next, you have to answer the questionnaire. Based on your answers, Hubspot will select the right course combination for you and you can begin learning right away. Hootsuite is a company that offers social media and customer resource management- related automation and optimization solutions. They also offer social media marketing certifications; a couple of which are free though most being paid certifications. These digital marketing certifications pertaining to social media are also industry- recognized and add much value to your CV. Adobe’s list of certifications is as wide as their product range. There is a certification for expertise in almost every product of theirs Dreamweaver, Illustrator for vector graphics, In- design for the print designer, Photoshop for image editing etc. You can also get certified in Adobe Advertising Cloud, Adobe Audience Manager, Adobe Campaign Adobe Analytics and Adobe Business Practitioner. These are advertising certifications by Adobe. Each exam has a total of 60 questions. You have to get 550/700 to pass the exam. Cost: USD 180 for each certification. World over, about 9% of the total population uses Bing as their preferred search engine. These statistics vary country-wise of course. Say in the US about 33% of the total population chooses to use Bing over Google, in the UK -26%, Taiwan- 24%. (data source- Statista). If you currently cater to clients in these countries, you might want to consider advertising on Bing too. Bing’s courses and certifications are absolutely free and you can complete these courses and exams as per your convenience. Basic and advanced techniques for setting up and optimizing Bing ads are covered in this course. You should obtain a score of 80% to be placed in Bing’s member directory for an entire year. Twitter flight school is a free online digital marketing certification course introduced by Twitter in the year 2014. It gives you an in-depth understanding of how the Twitter platform works, how relationships with potential clients can be developed and how to get the most out of Twitter Ads. There are two options to choose from. One is for executives who can learn how to build a brand on the Twitter platform and creating Twitter ad campaigns. The other course is for mid-level digital marketers who can refresh their Twitter content planning skills and ad budget allocation. Creating and managing objective-based campaigns on Twitter. Integrating Twitter into a TV campaign. Driving website and traffic conversions through Twitter. 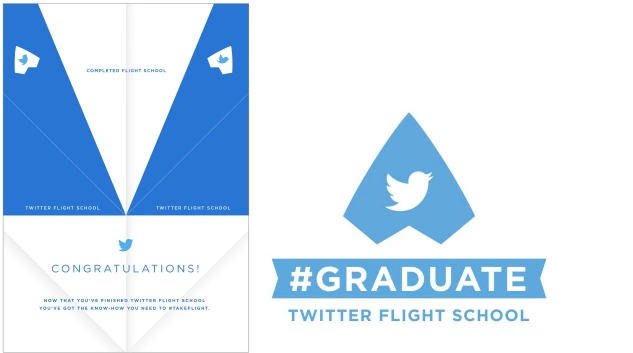 You get a printable certificate from Twitter Flight School after graduating from the course. 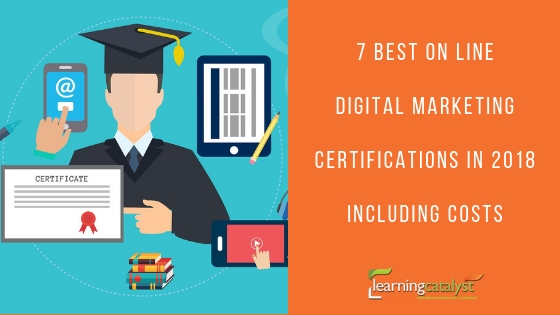 Amongst this list of the 7 best digital marketing certifications available online, we hope you must have found the ideal certification for you. Many local digital marketing institutions in your city are also affiliated with Google, Facebook and provide additional support to their students in obtaining these certifications. Some require you to get certified as a part of their curriculum. Good luck with getting your digital marketing certifications.